One gaze at Benta Akinyi immediately draws to her heavily scarred face. Perhaps used to the stares, Ms Akinyi exhibited little signs of self-consciousness. She simply made herself comfortable and started recounting a beating she got from her husband the previous night. “He has turned into a monster that beats me senseless. When I regain consciousness he asks why I am not dead. He keeps reminding me that he will kill me, and I think he means it,” said Akinyi. Akinyi said she had reported the assault by her husband at Karuri Police Station, where her case was booked for investigation. But, she said, police were not helping. “I have been to the police station countless times, but no one is helping me. That’s why my husband feels invincible. Each time I report, they dismiss me saying those are domestic issues. I have also been to the Central Police Station but I only spoke to a counsellor,” she narrated. A terrified Akinyi has since decided to walk out of the marriage with her two children. She vacated her Karuri home that was shared with Howard Muya. She sought refuge at a hospital in Nairobi.When reached for comment, a woman the victim of abuse referred to as Officer Koki, said Akinyi had indeed been to the Karuri police station. “Ms Akinyi recorded the assault case with us and she was promised that police would investigate the matter. Why didn’t she wait for authorities to do their work?” Koki asked. Pressed to give an update on the investigation, the officer said she had not been to the station long enough to know all the details about Akiny’s case. Mr Muya, on the other hand, was more forthcoming and admitted to beating Akinyi several times. He described his wife as a “difficult” woman. The 29-year-old cooking gas distributor at Muchatha market said his wife often went through his phone and insulted his female clients.He also admitted to once biting his wife on the neck when she went to report a different assault incidence to the police. Akinyi recalled the worst beating she got from her husband, which caused infection on her breasts.“In February last year, Howard (husband) came to the house and told me he wanted me gone. I was breastfeeding my daughter, who was only one-month-old. He pulled out a metal rod and started hitting me all over my body and on my breasts,” she narrated.The injured breasts later started emitting pus. “There was a terrible pain in my breasts. Little did I know that my baby was feeding on pus,” she said. Akinyi, 31, said she had also endured emotional turmoil after her husband started cheating on her shortly after they got married in 2015.“He brings a woman called Njambi in the house and the two call me all kinds of names because of my physical appearance,” she said. Muya, however, denied cheating on Akinyi.But that was not the only abusive relationship Akinyi had been in. Her face, she said, was scarred while she was living with a man called Felix in Homa Bay.Prior to meeting Felix, Akinyi said she was a runaway teenager after she was sexually assaulted by relatives who had taken her in after her parents died while she was eight years old.Before then she had sought help from a children’s home in Homa Bay, but said she was turned away. 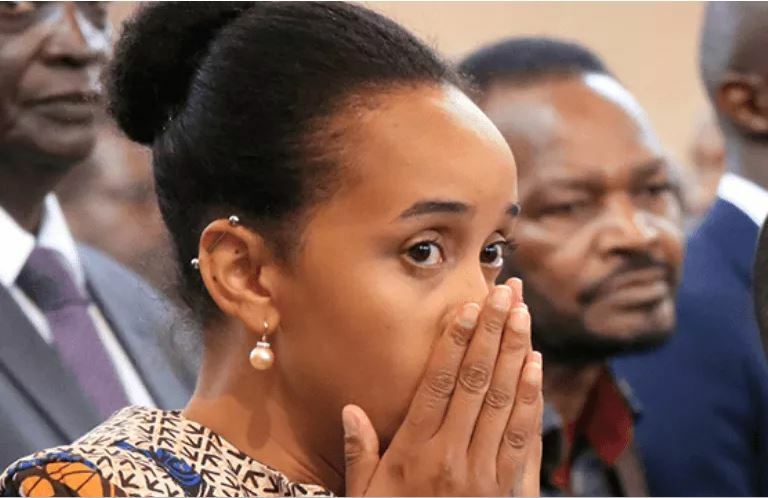 When she moved in with Felix, Akinyi said a clergyman at a nearby church offered to pay her school fees and pay her a stipend in exchange for sexual favours. Felix, she claimed, was agreeable to the arrangement.So the cleric paid for her secondary education until the day Akinyi decided to call off the relationship. She said Felix got furious when she made the decision to cut off their regular source of income and he decided to teach her a lesson. “One day as we walked down the road, I did not know he was hiding a mug full of sulfuric acid under a piece of cloth. He poured the acid on my neck and back, which caused me severe burns. Shocked, I turned to find out what was happening and that was when he poured the rest of the acid on my face and chest,” Akinyi recalled. She spent nine months in hospital, away from school where her classmates were preparing to sit the Kenya Certificate of Secondary Education examinations. Akinyi said she beat many odds, completed school and was admitted to the University of Eldoret, where she graduated with a diploma in community development in 2014, a year before she met Muya.“I had sworn never to fall in love again. It actually took a while before I fell for Howard. He always told me he was not ashamed of how I looked and would hold me even in public. I never knew he was capable of hurting me,” she said. A human rights counsellor at Central Police Station, who only gave her name as Veronica, said she had unsuccessfully tried to convince Akinyi to quit the abusive marriage. “I have tried several times to make her leave, but she always went back to the husband despite the emotional and physical abuse. I am glad that she has now made the bold step of leaving,” said Veronica. The counsellor said Akinyi and her children needed help.“I think the only thing that stopped her from leaving was the fear that she would not be able to raise her two children alone. But Akinyi is a very smart girl who can easily get a good job if she undergoes plastic surgery. She has shared with me the rejection she faces from potential recruiters because of her looks,” said the counsellor.